A teenage Emma is in the grocery store attempting to shoplift a box of Pop Tarts. She is stopped by a clerk. Another teenage girl saves Emma by pretending they are together and Emma was helping shop. Outside Emma’s new friend Lily shows Emma that she has a stolen credit card and suggests they do some real shopping. After their shopping spree a car chases them. The girls are able to get away. Emma and Lily have a sandwich in the park. Lily tells Emma that the houses across the lake are empty this time of year. She tells her they can stay there. The girls break in and make themselves at home playing video games. Lily has a star shaped scar on her wrist and tells Emma she cannot remember how she got it. Emma draws a star on her own wrist. They find a handheld camcorder and pose together. They make a promise to stay friends forever. Emma wakes up realizing someone is in the house with a flashlight. The man knows Lily and tells Emma that he is her father. Emma feels betrayed by Lily for making her think she was in the foster system like her. Outside Lily apologizes to Emma and tells her although she was adopted she feels like Emma. She pleads with Emma reminding her how they swore to be friends forever. Emma turns her back on Lily as she erases the star from her wrist. Elsa is anxious to confront the Snow Queen. They wonder if she has taken their memories. At the Sheriff’s station they are joined by Hook. Will complains about being hungry and Emma gives him a Pop Tart. Emma comes across an envelope with pictures from back when Sidney was doing surveillance on her. She is surprised to come across a photo of herself talking to the Snow Queen in the ice cream shop. I summon the Mirror and tell him his new task is to get me to the Snow Queen. Belle is at Mary’s to watch baby Neal. Mary is reluctant to leave with David. Elsa and Emma drive to my house. Elsa tells Emma she will wait for her and suggests Emma see me on her own. Emma comes to me and tells me she is searching for Sidney to ask about the pictures. I pretend I have no idea where he is. I snap at her reminding her I have to save Marian for Robin. She offers to help and I reject her. Elsa hears Anna’s voice. She leaves Emma’s car to find out where it is coming from. Emma is concerned to come back to an empty car wondering where Elsa went. The Mirror tries to bargain with me. I won’t have it and remind him he is not in a position to do so. He agrees to lead me to the Snow Queen. Mary and David go to the Sheriff’s station. She does not feel comfortable on her hike with David unless Belle can reach them. He takes the walkie talkies and realizes that Will is missing from his cell. I take my compact with me so the Mirror may direct me as to where I am going. I am surprised to run into Emma who is looking for Elsa. I quickly put the compact away but cannot get rid of Emma who wants to join me in looking for the Snow Queen. Elsa follows Anna’s voice to a cliff. She looks up and sees Anna on the other side. Elsa creates a bridge of ice. As soon as she gets close her sister disappears from sight. Mary cannot relax. David tells her she can go home and he will look for Will. Mary turns to leave and sees Will in the distance digging. She cannot help herself and has to see what he is up to. As Emma and I walk she compliments me. I sharply tell her that I do not care for her flattery. Elsa finds Anna. Anna is turned to ice and disappears. Elsa finds herself trapped with ice shackles. The Snow Queen tells her that it was not Anna but an illusion. She can sense Elsa’s fear and tells her that fear will keep her shackled which is what she needs right now so Elsa is not in her way. Mary approaches Will who is looking for his map and his sack. She tells him that she is the Sheriff’s wife and can pardon him if he tells her the truth. She believes that David trapped him and set him free as a hoax to make Mary feel better about herself for finding him. Emma and I find the ice bridge. As we cross it we are hit with a strong icy wind. I realize that Sidney is double crossing me. The bridge quickly begins to crumble. Emma and I marginally escape. Emma now knows that I was lying about Sidney. We find a Snowman wearing armor. Elsa concentrates on her fear. She overcomes it and is able to break free. Emma and I cannot defeat the Snowman on our own. We use our magic together to get rid of him. We are confronted by the Snow Queen who takes my compact and uses magic to keep us in place. Elsa uses her magic to break the Snow Queen’s hold. 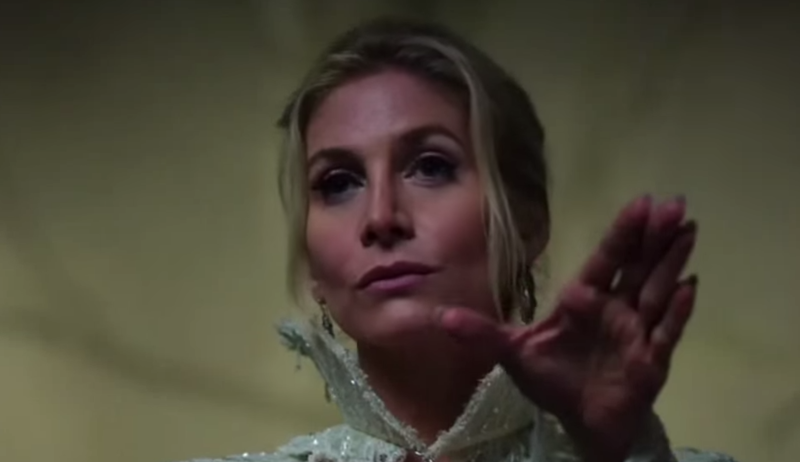 Elsa wants a confrontation but the Snow Queen tells us she has what she wants and disappears. Emma and I bicker as Elsa tries to make peace between us. I disappear. The Snow Queen has Sidney in her chambers. She has freed him from the Mirror. He is disappointed she has no use for him. She tells him she needs this compact because of all the dark magic that has been used with it. He asks what she wants it for but she still keeps it secret and sets him free. When Sidney is gone she shatters the compact and takes a shard from it. She sends the shard into a bigger shattered mirror which repairs itself with the new glass. Elsa tells Emma that she should not give up on me. With Elsa’s encouragement I find myself face to face with Emma again. I am surprised when Emma tells me that she is not pursuing forgiveness but thinks of me as a friend who she can relate to. She tells me about Lily and how she regrets not forgiving her. This softens me up to her. Mary goes home and tells David that she found Will and pardoned him. She tells him that she figured out David’s plan. David is surprised and surprises her back when he tells her he did not let Will escape. He then adds if the encounter made her feel better it is a good thing then. Hook goes to Emma at the station. They open a box with items from her past. They come across glasses, her baby blanket and even a photo of her with Neal back in Tallahassee. Emma finds a camcorder and they decide to watch an old video of her. They watch her and Lily act silly for the camera. This is bittersweet for Emma. Emma is surprised when the next video starts as she can’t remember it. Emma sees herself being teased in a foster home. She and Hook are shocked when they recognize her foster mother in the video not intervening. The foster mother is the Snow Queen.